Baruch Lopes Leão de Laguna was a notable representative of late 19th, early 20th century Dutch portrait painting. He was born in Amsterdam on 16 February 1864, to a Portuguese sephardic family. His early life was marred by tragedy, as would his later life be. His parents, Salomão Lopes de Leão Laguna and Sara Kroese, died when he was 11, and he was raised in the orphanage of the Portuguese Jewish community in Amsterdam. Teachers in the community were supportive and he trained at the Quellinus Art School and then at the National Academy of Fine Arts. To earn a living, Leão Laguna worked in the studio of painter Jacob Meijer de Haan. Gradually, he became successful and was able to devote himself entirely to his own painting. His first exhibition was held in 1885 at Arti et Amicitiae, a cultural association. His work was well received by both critics and fellow artists. He married Rose Asscher, the daughter of a diamond cutter. 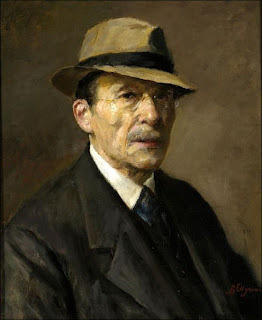 Baruch Lopes de Leão Laguna spent the first years of the Nazi occupation in hiding in a remote farm in Laren, and it is believed that painted the above self-portrait then. 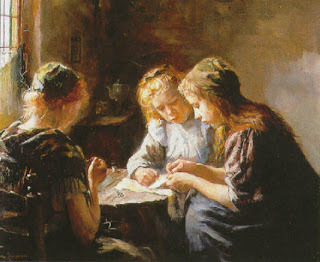 As a sign of gratitude, he offered it and several other paintings to the family that was, at great risk, helping him. Eventually, Baruch Lopes de Leão Laguna was caught and taken to the Auschwitz extermination camp, where he was murdered on 19 November 1943. He was 79.